As a lip liner junkie, I’m always on the hunt for the perfect liner that will leave my lips looking full, plump and natural. MAC is probably the world’s most spectated brand when it comes to the lip department, however, in the past year NYX have been producing high quality lip products such as their “Lip Lingerie” and “Lip Suede”. Until recently I’ve only ever used a MAC lip liner, but then I saw reviews saying how they would pick NYX over MAC any day, so this got me thinking, what one works best? The two lip liners I will be putting to the test today are MAC “Edge to Edge” £15 and NYX “Cannes” £4 (MAC 1st swatch, NYX 2nd swatch). 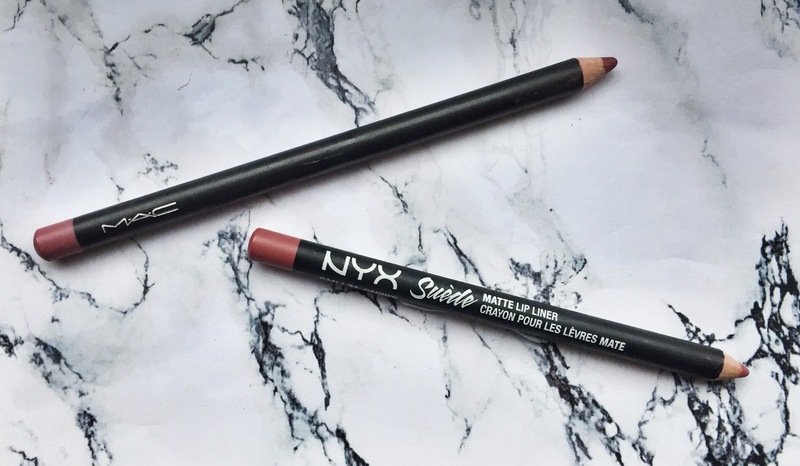 NYX – Maybe one of the creamiest lip liners I have tried to date! This product provides high pigmentation first time that can be built for a more harsher look, or left with one coat to give the illusion of having naturally fuller lips. For those of us who are more accidental, the liner can easily be removed with a cotton bud or makeup wipe without smudging and ruining the rest of your makeup! 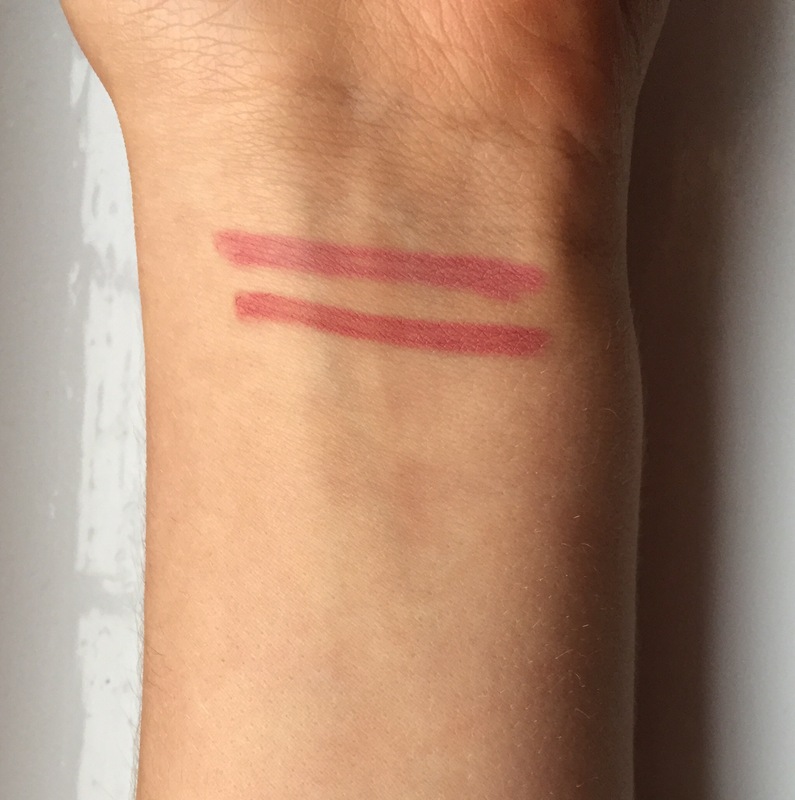 MAC – Compared to the NYX liner the consistency isn’t as creamy, making it a bit harder to apply. However, this makes me think that the product will last longer in the long run, as less product was used due to the consistency being more solid but still having high pigmentation so only a few “swipes” were needed. In terms of removing the product, this was a lot harder than the NYX liner, which left me with a more swollen look rather than a natural look! Have you ever had one of those liners that as soon as you take a sip of any liquid without a straw your upper lip suddenly vanishes? Well this is exactly what I was hoping to avoid when testing these products. In order to test the products durability I continued with my usual routine, eating and drinking how I usually would (no straw involved) to see how long each liner would last. NYX – Unfortunately, due to this product being so creamy this meant that it didn’t last as long and faded after eating and drinking. So if you are going somewhere you know you will be eating and drinking (lots) then I would avoid using this lip liner. However, for special occasions this product is perfect as it looks beautiful on and can last around 2-3 hours! MAC – This product really does last all day, after a full day’s work and three meals (of course plenty of snacking) I was still left with some pigment on my lips! Unfortunately, my lips weren’t as full as they were when I left the house, however, they did appear plumper compared to my natural lips, so to say I was happy would be an understatement! NYX – As soon as I put the pencil to my lips, there was instant pigmentation! Due to the liner having such a creamy consistency, the colour payoff is amazing, with a little going a long way. Other liners for this price tend to be low in pigmentation and take a few uses until they “soften” up, so if you are looking for a highly pigmented liner for just £4, this is the one! MAC – Much like the NYX liner, this product is highly pigmented, with a minimal amount being enough to complete any makeup look! For us makeup junkies, that don’t mind spending a little extra on a product, I would highly recommend any MAC liner, as not only do you pay for the name but you also pay for a high quality product that last! After comparing the two brands, I can see pros and cons to both, with NYX being extremely affordable, with high pigmentation and a creamy consistency and the MAC liner lasting all day, creating the illusions of naturally full lips. If I was to personally pick between the two in regards to what I look for in a liner, I would choose MAC, as being someone who works at a desk for 8 hours and is constantly eating, it’s important that the product last. However, I will be using the NYX liner in future and will purchase more shades, as for such a low price you really do get such a high quality product! Hope you enjoyed today’s post! Have an idea as to what you want us to speak about next? Let us know down below! P.S We will be doing a giveaway at 1,000 followers on Instagram so make sure you follow us for a chance to win! I’ve never tried NYX liners but I love my MAC liner. I just have one but absolutely love it! Thank you for a great comparison. I think its better to wait a bit and get the more expensive one!